Rabash, Dargot HaSulam (Steps of the Ladder), “The Matter of Tu Bishvat”: The Creator wishes for a person who observes a commandment, which is a fruit, to have both the tree and the fruit taste the same, in other words, for his intention to also be “Lishma,” for the sake of bestowal. We must go through several stages in our work. First of all, we need to descend to the degree described as “I created the evil inclination.” Here, a person becomes acquainted with his nature, and he sees how bad, opposite to goodness, he is. Goodness is Light, the property of bestowal. Where can I see the property of bestowal so as to measure myself in comparison to it and determine the evil wherein I exist? Where is this evil and the Creator who created the evil inclination? I must attain the Creator who created the evil inclination in me, and opposite to it, I must have the Torah as a spice. After all, there can be no darkness without light, and no light without darkness. We do not attain anything on its own, but only in comparison to its opposite. This is why man attains the bad nature in him only to the extent of his good deeds. This is the only way we can comprehend evil. So, the sinners that the Torah speaks of are special and great people. The degree of the sinner is a very high degree. One works in relation to goodness, trying to overcome the evil in him and attain goodness. Then, he comes to understand evil, reveals the sin of Adam (Man or Human), and begins the process of correction. In this way, the revelation of evil is a part of this process. Only after having understood evil, one begins to test whether the “tree” and the “fruit” are the same and whether they are in one direction, toward bestowal. After all, “fruit” is bestowal, not self-fulfillment. One tries to be above his egoism. He determines it to be evil which he needs to rise above. Over and over, he discovers that he wants and is able to enjoy and determines this to be a “plague of Egypt.” He is ready for anything but self-fulfillment. Then, he rises above all the possibilities to receive pleasure and comes to the real fruit: bestowal. Pleasure from bestowal is the fruit of the Tree of Knowledge. This is faith above reason, the faith grown on the Tree of Knowledge. The only way one grows is by rising above evil, above the property of reception that is being revealed in him, and refusing to use it in any way. Then, fruit grows within him. This symbolizes Tu Bishvat, the “New Year of the Trees.” Why is it trees instead of fruit? It’s because for now, one is still acquiring the property of bestowal and he is still to learn to receive for the sake of bestowal. On the spiritual path, we constantly keep discovering incorrect forms in us. As Baal HaSulam writes in the “Introduction of Talmud Eser Sefirot,” only those whose degree of patience has withstood merit to enter the King’s palace, the “garden” with the Tree of Knowledge in the middle. The Zohar, Chapter “Tzav (Command),” Item 18: Happy are the righteous in this world and in the next world, who know the ways of Torah, and who follow it on the path of truth. It is written about them, “The Lord, by them they live.” “By them” are the ways of Torah. “Live” means that they will exist in this world and in the next world. Each one of us is part righteous and part sinner. Perhaps one’s percentage of righteous is still zero, while the sinner in him comprises 100%. Or it may be that he is in the process of transforming the sinner’s part, his desire which is 100% intention to receive for oneself, into the intention for the sake of bestowal. Then that part is called the righteous within us. 1. We pass to the state where we feel ourselves as sinners. 2. We take part of our desires from there and correct them. 3. That very moment we become the righteous. 4. Then, we become sinners again by going back to another uncorrected desire to receive pleasure. 5. Once again, we transfer part of our desires into the intention for the sake of bestowal. This way, our corrections accumulate piece by piece into one general correction. Question: Is there a difference in the efforts that I’m required to apply when I fulfill the conditions of the mutual guarantee for the first time and when it happens for the second time? Answer: The difference is in a sensation of a lack, in that I now intend to achieve the second degree on the basis of the first. The first degree stays in me as a Reshimo (internal record, imprint), a state that I have experienced but could not preserve because of an additional desire to receive. I must now overcome this additional desire in order to attain the next degree. The previous degree helps me to reach the next one. These are not degrees of a descent, but those of an ascent. In other words, even if I fall, I understand why I have fallen and know what I have to do. Based on my own experience I already know how I managed to reach the state of a mutual guarantee on the first degree, and now I am going to do the same on the following degree. This is called “a person’s soul teaches him,” meaning that I have gained experience and I know what to do. It is clear to me now that my descents are not states where I simply lose myself. I realize that I am in a descent now and that I lack strength (contact with the Creator). It is already a realization that I am in darkness, that I have lost touch with the Creator. In other words, the point of awareness of or contact with spirituality is preserved, and that is very important. Now I begin my work from that point instead of a state completely detached from spirituality. Expressed differently, you do not lose your previous level due to a “sin”; rather, you fall from the first degree because you have been given a desire of a second, higher degree. The magnitude of the uncorrected desire of the second degree, the sin that is being revealed to you now, overshadows the corrected degree, although the first degree stays inside the second in the corrected form. It is actually an ascent, and not a fall; you have achieved the first degree and have now revealed the second degree, its opposite side. In the AHP of the Upper One, you feel yourself as “fallen,” a “sinner.” However, it is the way you define yourself from the perspective of the corrected first degree. It exemplifies the saying “a person’s soul teaches him” because I already have a soul. Indeed, the first degree is my soul. Afterward, I will develop a soul of a magnitude that corresponds to the second degree, then the third, and so on. Each time higher degrees will be emerging inside me; they will conceal the previous degrees to a greater extent, but I will always have the strength, the connection to the Light in order to ascend. I always discern each subsequent degree of an ascent based on the degree which I have already achieved. It means that I will have an opportunity to correctly diagnose what is happening to me and how to draw the Light that Reforms. Therefore, Baal HaSulam writes that the real stumbling block is attaining the first degree. Until it happens a person feels completely confused. Question: If “there is none else beside Him” and everything is done only by Him, then why am I considered to be a sinner? Answer: When the evil becomes revealed to me for the first time, this is not yet considered to be my sin. However, if after having discovered an evil desire within, I still plan on using it, now this goes on my account. When this happens for the second time, it is considered to be a sin. It is like repeatedly tasting the fruit from the Tree of Knowledge. However, it is only when this happens for the third time that I am considered to be a real sinner. The second time is only the revelation that I exist in evil. Let’s say, I committed a crime, but this was my very first time. Even courts take this into consideration as extenuating circumstances. I am given a light punishment as a warning to help me never do anything like this again. In other words, I am given the force of correction. However, when, regardless of the correction that I am given in accordance with the transgression, I still repeat the crime because the criminal desire that awakens in me is even greater than the punishment or fear of a crime, this means that I have really sinned. When I transgress for the first time, the magnitude of my evil is revealed to me. For now, this is not called a sin. 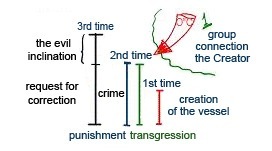 The second time, I reveal how big of a crime against the Creator it is, and I am given a punishment for it that is slightly greater than the sin. If I now reveal this kind of desire in me for the third time, and the desire is even bigger than before, then this difference is called "the evil inclination" because it is in it that I go against the Creator. This is the force of the Pharaoh within me. Now, this is a real sin. It is there where I need to repent and ask for forgiveness. Now I am undoubtedly a sinner. The first time is merely the creation of a vessel (the desire). The second time is the evaluation of my sin. While the third time is the true crime, it is only as the result of this crime that the appeal for correction appears. However, the most important part is that all of this is only possible through the Surrounding Light which comes in the form of a “group” or the connection within which the Creator exists. This means that “Israel (one who strives toward the Creator), Torah (the Light of correction), and the Creator are one." Laitman.com Post: What Is A "Sin"? A “sin” is determined by whether or not you ask the Creator for the strength to rise above your sensations of “good” and “evil.” The first time you do something is not a sin! Maybe you have not yet discerned good and evil and your attitude to Him. However, if you do it a second time, it becomes a sin. And if you repeat it a third time, you descend from your degree; you cannot remain on it any longer. With the first interaction of the pleasure and the desire, a desire for the pleasure (a vessel, Kli) is created. At the second interaction of the pleasure and the desire, one receives a feeling of transgression (a sin), reception for one’s own sake. But if one receives pleasure in the desire for a third time, then it not only indicates the performance of a sin, but also shows that the sensation of the sin was not sufficient in order to refrain from it. This can be likened to a situation where the sentence ruled by a court is weaker than the criminal desire and, therefore, does not reform one from stealing in the future. And then a decision is made to conceal me in the prison of this world. How, during the Ten Days of Repentance (Selichot), between the New Year (Rosh Hashanah) and the Day of Atonement (Yom Kippur), can we see ourselves as the completely wicked? A “completely wicked” will surely attain repentance, Selichot. But we can feel as such only if the Light comes and exposes our true nature. We are already the completely wicked, except that we don’t recognize it for there isn’t enough Light. In other words, to become the wicked, we don’t have to commit any transgressions since we are already in them. We just lack awareness of our evil. There isn’t anything we haven’t done in our egoism: stole, killed, and gossiped, but we didn’t realize it was a sin. And indeed, this isn’t the sin that the Torah is talking about and what the Creator implies. To prepare to repent means to try to unite and through our unity draw the Light that Reforms. Then, we will unfold our sin, our unwillingness to be one. The only sin there is lies in the rejection of oneness. In fact, a person would do anything, even die, rather than unite with the others! And when a person realizes that there is nothing more important than this but that he has no desire for it, he is ready to repent. We lack only awareness of our evil to be able to cry out and ask for the strength to unite, for the force of love and correction. Question: Does every person need to experience all of the states described in The Zohar? Answer: It is written, “Every man has to write the Torah.” This means that a person gradually needs to reveal all of his or her qualities or desires in their initial egoistic form and, to the extent of their revelation, correct them by changing the intention from “for myself” to “for the sake of others or the Creator.” Thereby a person builds a new vessel that has a screen and Ohr Hochma that fills it. The revelation of the broken Kli means that a person clothes into a certain type of a sinner as described in the Torah. With the consequent correction of this state, he clothes into a righteous man from the Torah. A person has to assume these images and forms time after time, alternating between clothing into a sinner and a righteous man, both of which are presented to him by the Torah. It is like an imprint of models that already exist in you. It is as if you were walking in darkness with a projector and alternate between shedding light onto a sinner that has clothed in you and a righteous man on the opposite end. In this way, you go from image to image every time. You must go through all of them! This is because the entire Torah consists of states that you experience, beginning with Adam: the first revelation of evil in you and the first contact with the Creator. Man begins with experiencing the sensation of his egoism in contradiction to the Creator. The entire Torah only speaks about these consecutive clothings into different roles that you play like in theater and according to a script given to you. You clothe into different figures, but you are the only one playing this multitude of roles. In the article “When a Person Knows What the Fear of God Is,” Rabash writes that a sin takes place particularly during an ascent when a person, throwing away faith, merits the Creator’s love and decides to use it as a foundation for his work. A person thinks that he will never descend again since he will advance according to his common sense. However, he descends again into self-love, into punishment, for the fact that he has lost faith. And this punishment is correction that helps him return to the direct path of ascending the spiritual ladder. This is precisely how we should interpret our states. A state where it seems to us that we are in a descent and that we have received a punishment is actually given for our correction. Feeling one’s sin means not sinning anymore. A sin is what we have done prior to this! And the feeling of a committed sin is already correction. Answer: We call any downfall “sin,” but do we really sin? In our world, it is considered a sin when I think that I can resist an act that I know is unacceptable, but still do it. But it isn’t really so because if I knew for a fact that it is prohibited, I wouldn’t do it. Actually, sin is when I am overtaken and overpowered by the forces of separation. Sin is the state itself but not its cause. The cause always lies with the Creator. It is He who created our evil egoistic inclination. Before the breaking, it was just a will to receive pleasure, an animal. If a lion, for instance, wants to kill a deer, we don’t consider it to be an evil inclination; a lion is simply moved by instinct, a desire to be filled. So, when does the evil inclination appear? It appears when we ascend, receive forces of love and unity there, then fall with them and the forces turn into their opposite: unfounded hatred. Now the desire to feel pleasure, which includes all the informational data (Reshimot) that are pushing it toward this unfounded hatred, is called the evil inclination. From this moment on, it wishes to use everyone else to their detriment because that is what it enjoys. In other words, in a human appears a sensation of another human (which animals don’t possess), and he enjoys when the other suffers. That is genuine egoism! In contrast, good is when I turn this hatred into love. Yet, a relationship with the other is necessary in both cases. A question I received: Why is it written in the Introduction to The Study of the Ten Sefirot, Item 55, that a person who attained “open Providence [that is, revealed the Creator] is certain that he will not sin again”? My Answer: A person is certain that he won’t sin because he has corrected, with the help of the screen and the Reflected Light, all his desires to receive. He rose above them and now can proceed further. He needs “the Creator to testify” for his correction in order to continue working with his desires to receive and start using them for receiving in order to bestow. I need an additional general force which is called the testimony of the Creator. Now I have to open my Pandora’s box that contains all my desires and begin to clarify in which of them I can receive pleasure and thereby delight the Creator. This is a totally new tendency, which has never existed before. I have never done it, and now I have to taste pleasures in order to delight the Creator much like a guest who partakes in the feast to satisfy the host. In order not to err, I have to collect the unique, new forces provided by the Creator’s testimony. Otherwise, I shouldn’t even touch and start disclosing my new receiving desires. I need an additional assisting force. And “When He who knows all mysteries will testy that I will not turn back to folly,” I will be able to begin correcting my transgressions. In this stage, transgressions have already turned into mistakes, and I should feel better, as it were. I have already corrected half of the receiving desire, and it is fully filled with the Light of Hassadim. Now I have to begin working with it in the three lines and introduce a little bit of the Light of Hochma into it. This means that my transgressions have become mistakes. I am going to receive in order to bestow, but I already possess the intention “in order to bestow.” I only need to very carefully add reception to it. When we attain such a high spiritual level, we will realize what this work is all about. Laitman.com Post: Is Concealment Hiding Within Me?